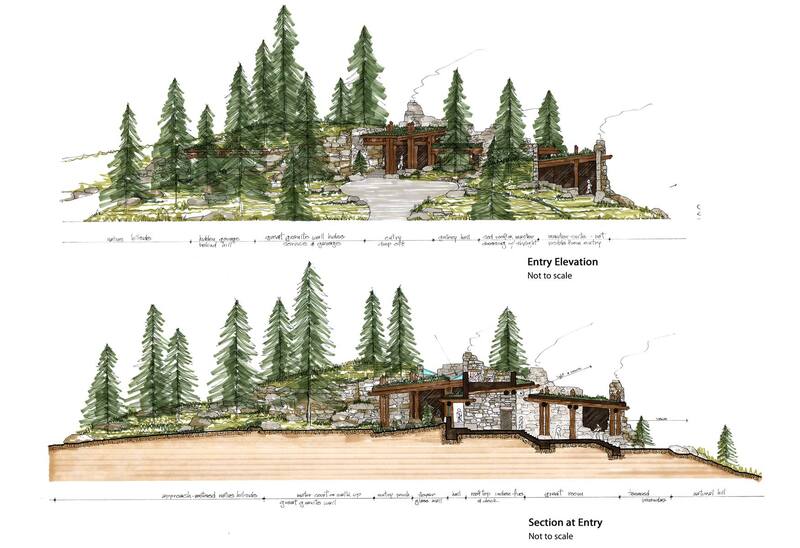 Mr. Lauren, Doug Ewing, FAIA and Bobby Allison took a jeep ride up to the Dallas Divide to find the perfect site to design and build a house for the Laurens. We walked on a granite east facing down slope with a distant lake and spectacular vistas of the mountains beyond. This was the place to design the house. This east facing orientation gives shelter to the outdoor spaces from the western prevailing winds and snow. Mr. Lauren wanted a house that was unimposing in scale, natural in feeling with great slabs of glass that fit between natural elements to frame the views. 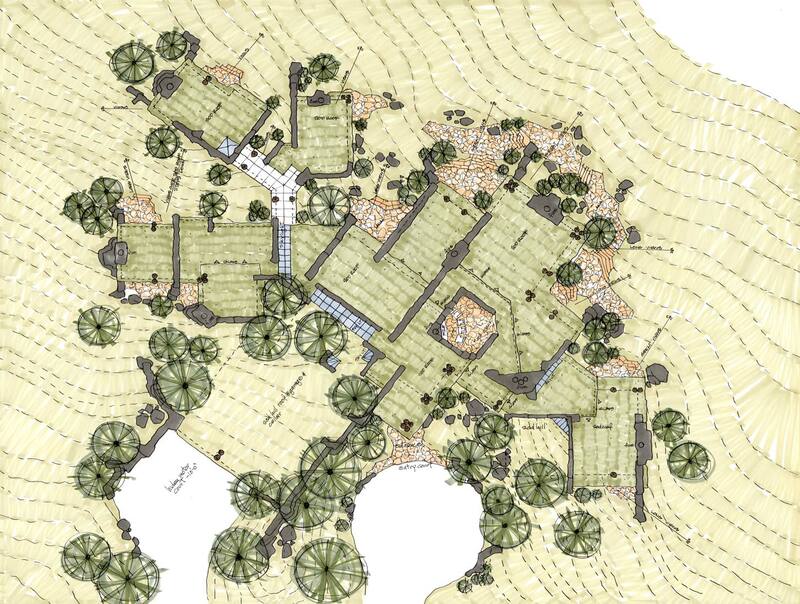 The new house is not visible from the approach except for a small section of the entry and foyer structure, which disappear into natural forms. All you see is granite rock formations, native grasses and indigenous trees. The garages and service areas are completely covered by 5 to 10 feet of earth with pine trees and grasses growing on the roof, and a natural granite terraced wall disguising them from the approach. 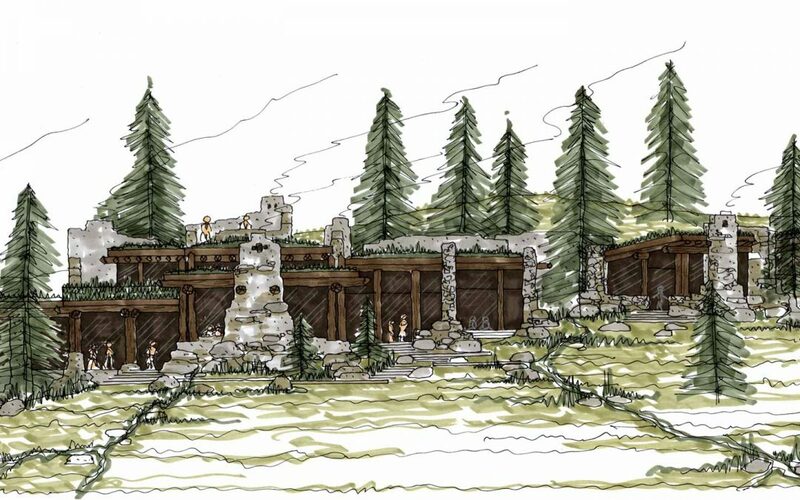 The east side of the house terraces down the slope and is formed by rugged granite walls, log columns and expansive glass walls. The sloped and curved earth and grass roof shapes buffer the prevailing winds like an air wing foil creating quiet, calm space on the eastern lanais. 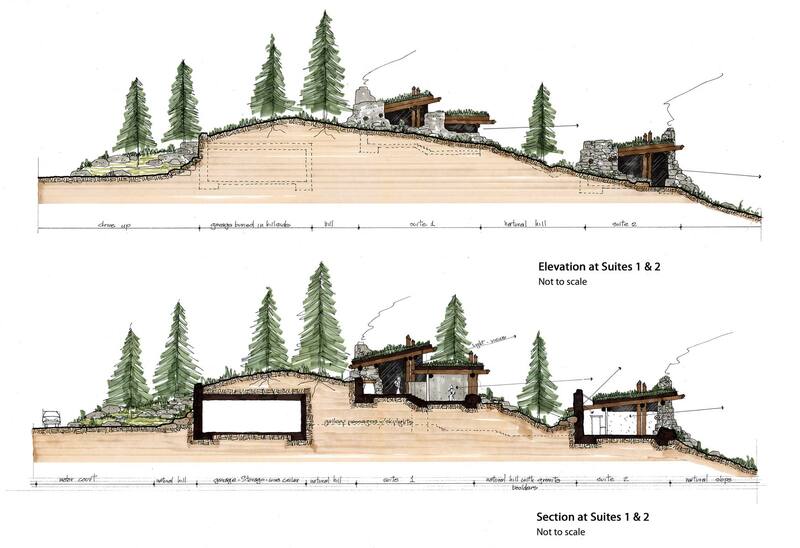 The use of indigenous and reclaimed building materials, fire killed logs, earth and native grass roof materials, and an architectural design that properly orients the house on the site to allow “buffering”, combine to create a unique and sustainable project. 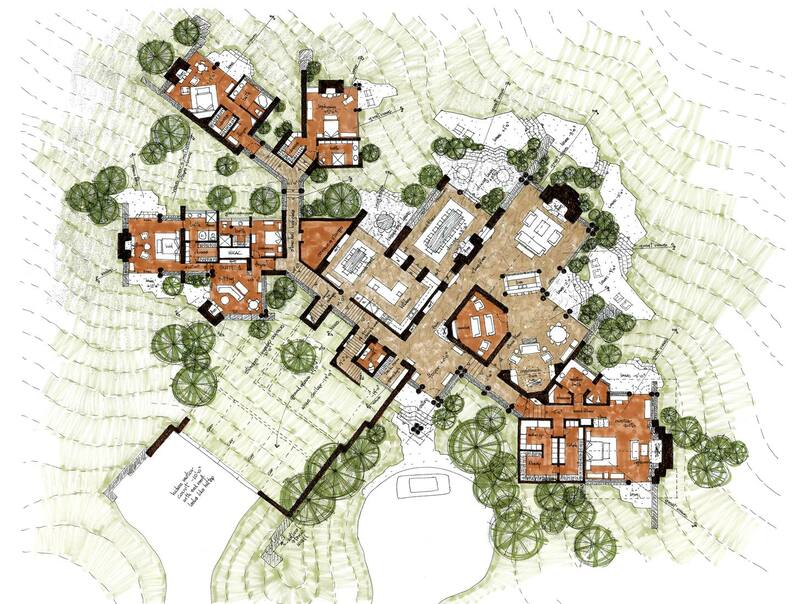 Floor Plan Concept: The house is sited on an east facing downslope and is basically invisible from the approach. • The fractured plan terraces down the natural granite slope and exposes numerous granite lanais and outdoor uses. Streams or pools can be included. 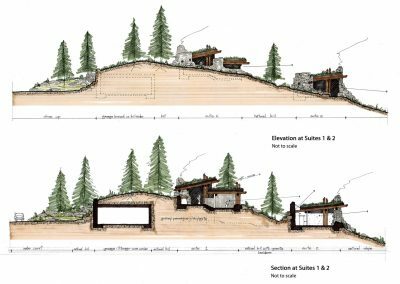 • The garages are hidden behind a granite terraced wall and earth hill roof with pine trees and native grasses. • The bedroom suites 1,2, & 3 step-down the slope with each one looking over the grass roofs of the one below. You are not aware of the other suite’s existence. • There are no traditional windows, only glass walls that extend out of granite walls or between timber columns. Some glass walls slide into recesses and appear not to be there. • Several skylight troughs direct light into the house interior. • The foyer has a “warming” Indian fire wall not requiring a screen and granite walls and niches for collections. • The great room has a family sitting and fireplace area, a large walk-in inglenook fire wall, a stone media cave room, and a wine bar all looking at the eastern views.